I just got this great MAGnet gun caddy. This is a great way to store your gun that is secure. It’s a magnet caddy that sticks to any metal surface, perfect for the car. You can simply attach the gun into the foam holder that snugly and securely holds the gun into place. This way you don’t have to lay your gun down on the ground when your not using it, you can securely place it into the gun caddy and have no worries about it being damaged or even possibly going off by accident. The magnet sticks really well and holds the gun really well. It also came with a cinch bag holder that you can use to organize your trash bags, actually I use mine for walmart sacks. It has a sticky back so I just mount mine in the back of the car and I can grab a bag when I need it. works really well. Like an extra hand (but much smaller than your fist), the MAGnet Gun Caddy conveniently secures your gun when you need to temporarily set it down. 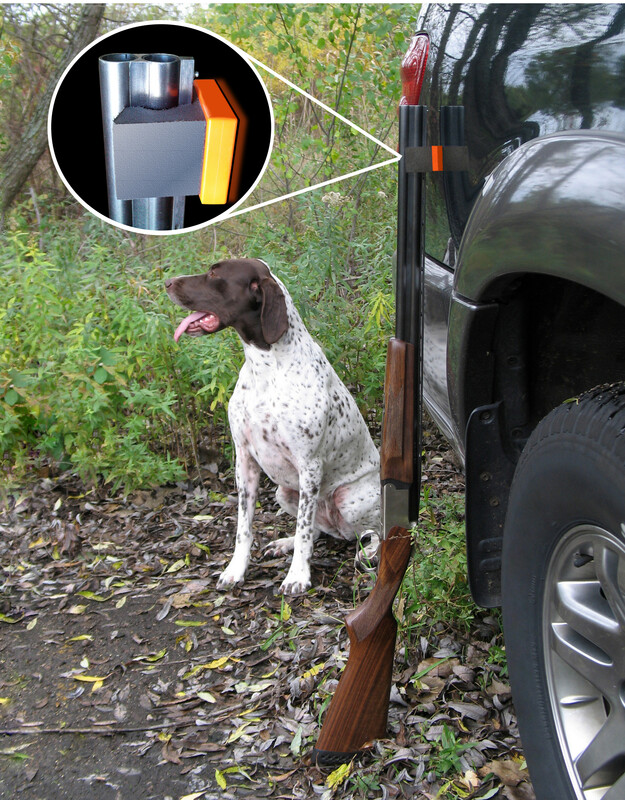 It holds just about any long barrel gun upright against your vehicle, gun safe, or any surface with metal. The patented design makes it possible to secure and remove your gun from the holder with just one hand. The MGC utilizes the strongest Soft Magnet that can be manufactured. It’s 1/4″ thick with dual poles in both directions. Which means it’s going to hold strong to the metal surface, and also resist sliding. Other stronger magnets are available, however a balance was required between the holding strength needed to safely secure the gun, but not too strong that it would cause scratching of a painted surface. So, How strong is it? Just watch the Tilt Demo Video. How many portable magnet gun racks can you do that with? Answer: One, The MAGnet Gun Caddy. Why is that important? Racks that you just lean your gun into are susceptible to accidents too. A simple bump, or someone getting in or out of the vehicle – even the slamming of a door can jolt a gun out of a rack that does not secure the barrel. With its soft high-energy magnet, it’s the only portable magnetic gun rack that actually secures (holds) the barrel of your gun (it’s not just another place to “lean” your gun) and the US Patent Office agrees with us. The MAGnet Gun Caddy protects your gun and your car and is small enough to fit in your pocket – making it truly portable and easy to store. It’s A SMARTER WAY TO REST YOUR GUN ! You can find it on the MAGnet Gun Caddy Website!